We build portfolios for long-term investors. 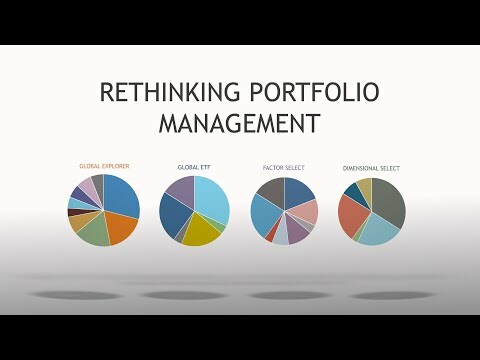 All our portfolios have a few things in common. Diversification. Global diversification can improve performance and control risk. Objectivity. Clients’ interests come first. We avoid conflicts of interest. No proprietary products. Balance. We balance our understanding of history and research with real-world experience. Low Cost. Controlling costs and expenses allows clients to keep more of what they earn. Discipline. Our well-defined process allows us to better navigate both good and bad markets. Patience. Success in investing takes time. We are willing to wait for our ideas to bear fruit. The core is the foundation of each portfolio. The core consists of low-cost ETFs that track US and International stock and bond markets. Satellites investments provide the opportunity to benefit from improved diversification, specialized strategies, or the skill of an active manager. Satellite investments are added only when our investment committee has high conviction they can increase return or reduce risk. Satellites investments may be actively managed mutual funds, index funds, or ETFs. We offer the Global Explorer portfolios at five risk levels ranging from 20% equity to 100% equity. We also offer tax-sensitive versions of all Global Explorer portfolios. The composition of these portfolios is elegantly simple to provide broad diversification, while minimizing costs. They use only low-cost ETFs that track US and international stock and bond markets. The portfolios are managed to a fixed asset allocation target and are rebalanced annually. We offer the Global ETF portfolios at five risk levels ranging from 20% equity to 100% equity. We also offer tax-sensitive versions of all Global ETF portfolios. These factors have had relatively low correlation to each other. That is, they tend to produce their performance benefits during different time periods. By combining funds with exposure to all of them, we seek to gain more stable returns through added diversification. We build these portfolios using an open architecture approach that allows us to utilize funds from different asset management firms. Each firm defines and manages exposure to the factors somewhat differently, giving our portfolios additional factor diversity. We also build and manage Dimensional Select portfolios—factor-based strategies consisting solely of mutual funds from Dimensional Fund Advisors (DFA). Our Dimensional Select portfolios are available only to advisors who are approved to purchase DFA funds. We offer the Factor Select portfolios at five risk levels ranging from 20% equity to 100% equity. We also offer tax-sensitive versions of all Factor Select portfolios. Remain humble. No one can predict the future. There are simply too many variables. Don’t confuse likelihoods with certainties. You can calculate probabilities, but there are no guarantees. Be prepared for the unexpected. History provides insights about the future, but it won’t repeat itself. Academic research finds “truth” by looking backwards. Consider how it will translate in the future. Good ideas take time to mature. Knowing something will happen is not the same as knowing when. Controlling expenses is important. Reducing fees, transaction costs and taxes improves results. It is difficult for active managers to add value. Reaping their value requires knowledge and patience. Diversification works. But it should be done intelligently to avoid over-complexity and excess costs. Emotion is the enemy of good decisions. Discipline is important. Judgment and restraint are mandatory. Every portfolio has an investor attached. A portfolio is the result it produces and the experience it creates.